Ridivihara in Ridigama is the most significant heritage site in the northeastern foothills of Sri Lanka’s central highlands. In fact, the temple is one of the most rewarding cultural destinations of the entire island nation. It’s less known to foreign travellers only because of its location away from the main roads and tourist routes. There are several reasons to count Ridivihara among the greates attractions of Sri Lanka. It has one of Sri Lanka’s largest painted caves in the Kandyan monastic style, second only to Dambulla. It also has a small but quite distinctive and enchanting Polonnaruwa-period stone hall which is not in ruins. The Ridivihara looks back to 2000 years of monastic tradition. There is rarely any other monastery in the world that has been inhabited by monks for such a long period. Furthermore, this Buddhist monastery is a vivid and genuine example of Sri Lanka’s Buddhist traditions. Foreigners are welcome and treated as guests, not as fundraising potential. Ridi Vihara or Ridi Viharaya is the name of the monastery 2 km south of the village of Ridigama. The former name translates to “silver monastery” and the latter to “silver village”. The name refers to a silver ore found in the main cave, which helped to finance the construction of the giant stupa of Ruwanweliseya in Anuradhapura in the 2nd century BC. 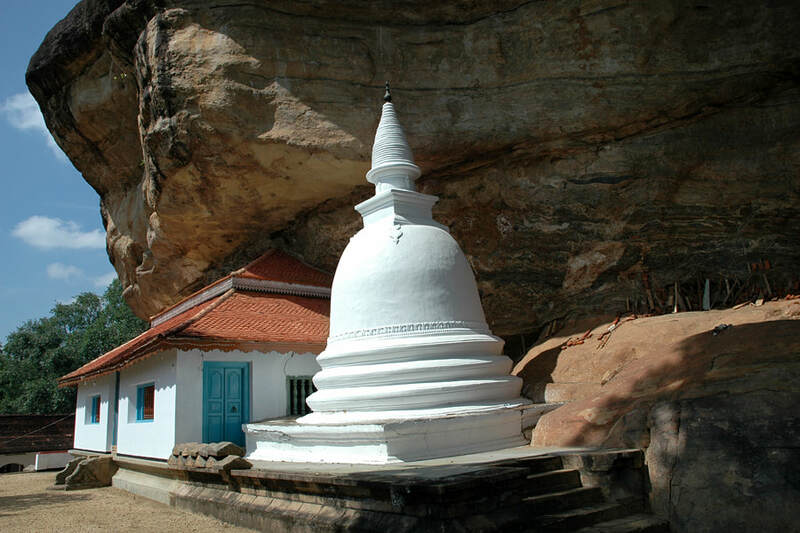 Out of gratitude, King Dutthagamani donated the caves to the Buddhist Sangha.